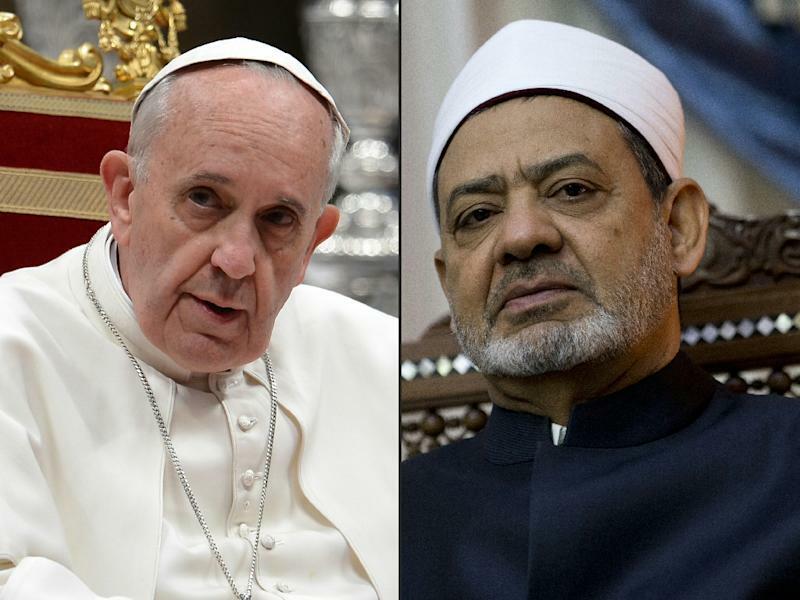 Vatican City (AFP) - Pope Francis is to meet the grand imam of Cairo's Al-Azhar at the Vatican on Monday in an unprecedented encounter between the leader of the world's Catholics and the highest authority in Sunni Islam. Sheikh Ahmed al-Tayeb, who heads the mosque and seat of learning considered the most prestigious institution in the main branch of Islam, will have an audience with the leader of the world's 1.2 billion Catholics, Vatican spokesman Federico Lombardi told AFP. "This audience is being prepared and has been scheduled for Monday," he said. "It will be a first". The hugely symbolic visit comes against the backdrop of a recent improvement in relations between the two faiths after serious tensions during the time of Francis's predecessor, Benedict XVI. Dialogue resumed in 2009 but was suspended again by Al-Azhar in 2011 when Benedict called for the protection of Christian minorities after a bomb attack on a church in Alexandria, an intervention that was perceived as meddling in Egypt's internal affairs. Relations have steadily improved since Francis became pope in 2013 with inter-faith dialogue near the top of his agenda, something he underlined with a personal message to the Muslim world to mark the end of the first month of Ramadan of his pontificate. A representative of the Al-Azhar mosque, Mahmoud Azab, took part in an inter-faith conference at the Vatican in March 2014 aimed at fostering cooperation on combating modern slavery and people trafficking. "The dialogue was never cut, it was just suspended," Azab said at the time, adding that the idea was not "dialogue for its own sake. There has to be a clear agenda." On a trip to Jordan and Israel in May 2014, Francis was accompanied by two old friends from his days in Buenos Aires, the Rabbi Abraham Skorka and Islamic studies professor Omar Abboud. He has also pursued a historic rapprochement with the Orthodox Church, meeting the Russian patriarch in Cuba last year, and overseen the finessing of Catholic thinking on the need for Jews to convert, easing long-standing tensions with Judaism. The 79-year-old pope made headlines in April when he returned from a trip to the migrant crisis island of Lesbos with three Syrian Muslim families who are now being put up by the Vatican as they apply for asylum in Italy. Church officials say the choice of families was random but the gesture was nevertheless highlighted by media throughout the Islamic world and Francis came under fire from some on his own turf for not picking some of the Christians asylum-seekers in limbo on Lesbos. The pope has however shown himself willing to speak out about aspects of Islam he has issues with, most notably in December 2014 when he said it would wonderful if some Muslim leaders "spoke up clearly and condemned" extremist violence carried out in the name of their religion. Those remarks were seen at the time as reflecting mounting concern over the plight of Christians in the Middle East against the backdrop of the civil war in Syria and the rise of the Islamic State (IS) group. The Vatican sees IS as determined to drive Christian and other non-Muslim minorities out of Iraq and Syria, and that has helped to accelerate the push for dialogue with Muslim leaders willing to try and stop that happening, experts say. There is also a view in the Holy See that there is a struggle for the soul of Islam going on and that Vatican diplomacy should focus energetically on ensuring the right side comes out on top.